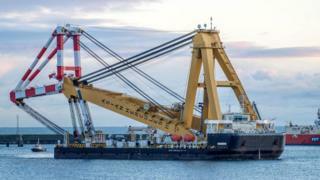 A massive floating crane has arrived in Peterhead ahead of work on the construction of wind turbines off Aberdeen. The 11 turbines will make up the European Offshore Wind Deployment Centre (EOWDC) off Aberdeen. Energy firm Vattenfall is behind the project. The 25,000-tonne Asian Hercules III arrived ahead of work involving suction bucket foundations involved in the construction.